Thanks to some key employment sectors, job growth in Houston has accelerated to levels not seen since the oil slump. 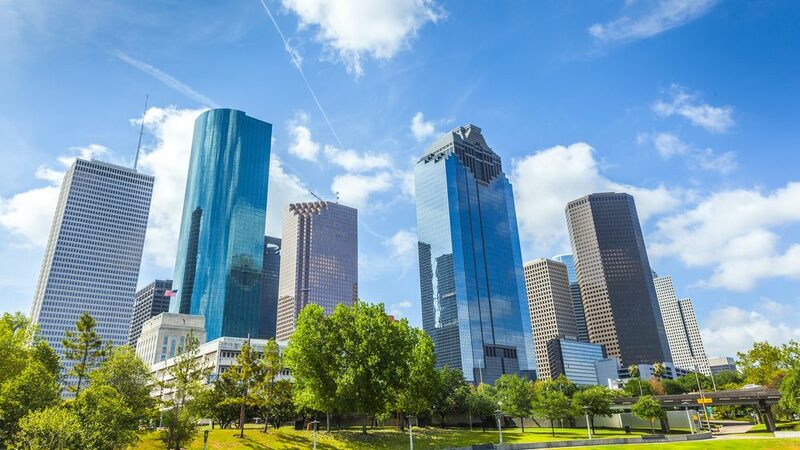 According to the Bureau of Labor Statistics, annual job growth in Houston surged to 84,500 positions in April and 79,200 positions in May. This most recent performance made Houston a top three national player for annual job growth in May, behind only New York and Dallas. Houston’s employment base swelled 2.6% in the year-ending May, well over the 1.6% expansion seen in the U.S. overall. By comparison, the market trailed the national average from mid-2015 through 2017, with growth rates below 2% over that time. The job market here – the Energy Capital of the World – has historically followed trends in the energy sector. Like the performance in that industry, Houston hasn’t seen employment hikes of this magnitude in over three years, though the metro hasn’t quite made it back to the superior levels recorded prior to the oil price collapse in mid-2014. Then the metro saw another setback in September 2017, when Hurricane Harvey brought record-breaking rainfall, momentarily disrupting the economic build. As the flooding cleared up, however, fiscal recovery continued, and at a renewed pace. By the end of that year, job growth once again surpassed the national average, and Houston has been gaining momentum nearly every month since. Job growth has improved across most employment sectors, though increases are largest in energy-related fields. The sectors recording the biggest surge in May 2018 were Professional and Business Services and Manufacturing, which are now gaining about 5,000 to 6,000 more jobs than they were just a few months ago. Professional and Business Services, which accounts for 16.4% of the employment base in Houston, added 33,600 jobs in the year-ending May, growing the employment base a notable 7%. This sector saw mild job cuts in 2016, and has since made a major comeback. The recent job gain total is the strongest growth this sector has seen in six years. Houston’s Manufacturing sector is affected by the ebb and flow of the oil and gas industry, as the areas around the metro’s ship channel and Gulf Coast line are accountable for a large share of U.S. petrochemical manufacturing. 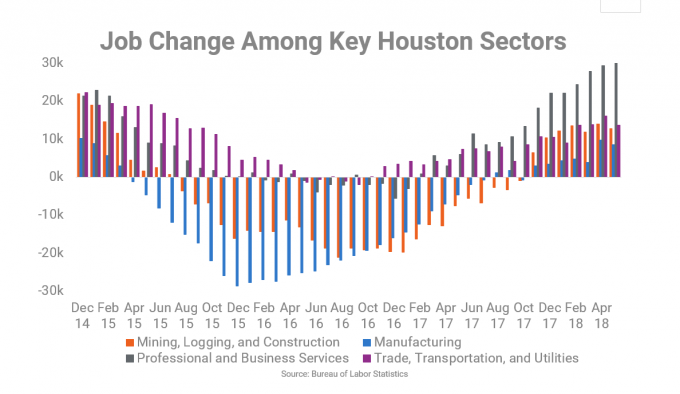 Because of that relationship, Houston’s manufacturing sector also saw notable declines throughout much of 2015 and 2016 and is now back to the logging the kinds of gains this segment enjoyed prior to the energy bust. Meanwhile, Wholesale Trade, which ties into the oil and gas industry through energy commodities, suffered job cuts throughout much of the downturn, with setbacks getting as steep as 5,700 jobs slashed in the year-ending April 2016. The segment gained 3,500 jobs in the year-ending May. 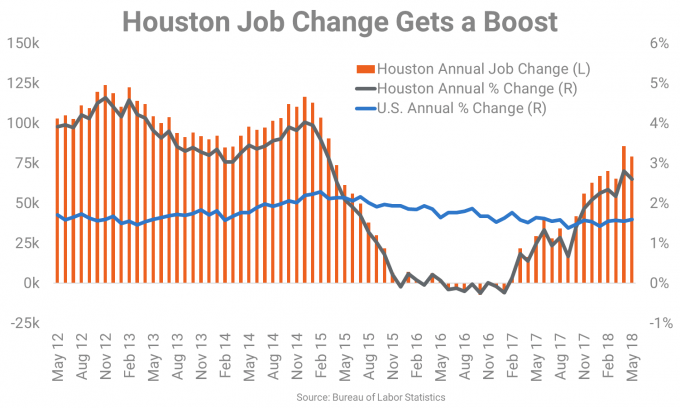 Looking ahead, the Houston job market should continue its rebound in the near term, as oil prices proceed along the path to recovery and the metro’s key employment sectors enjoy a renewed stabilization.